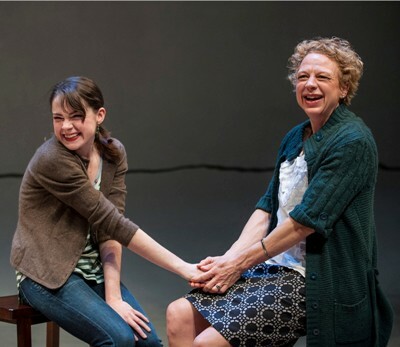 In her play “Still Alice,” author and director Christine Mary Dunford employs a graphic metaphor to illustrate the disintegrating world of Alice, a victim of early-onset Alzheimer’s disease. 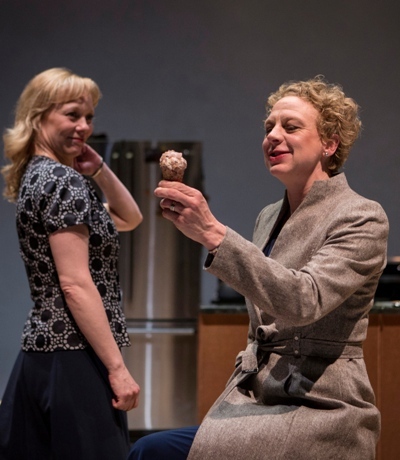 Throughout the play, now in its world premiere run at Lookingglass Theatre, Alice’s kitchen appliances disappear one by one, until nothing remains – until the locus, the defining “here,” of this woman’s life is no longer there. Alice – charged with urgent humanity by Eva Barr — is 50 years old in this story adapted for the stage from a book by Lisa Genova. An esteemed professor and published expert on cognitive psychology, Alice is also married to a scientist. They have two children, Thomas, a lawyer whose career is beginning to take off, and his younger sister Lydia, who has bypassed college in her zealous pursuit of an acting career. By the time Alice’s Alzheimer’s has run its course, none of their lives will be quite the same, and relationships between brother and sister and between the kids and their parents will be tested near the snapping point. Viewed through this multifaceted prism, “Still Alice” is the furthest thing from a process piece about the herky-jerky but inevitably downward path of a brilliant woman’s dementia. 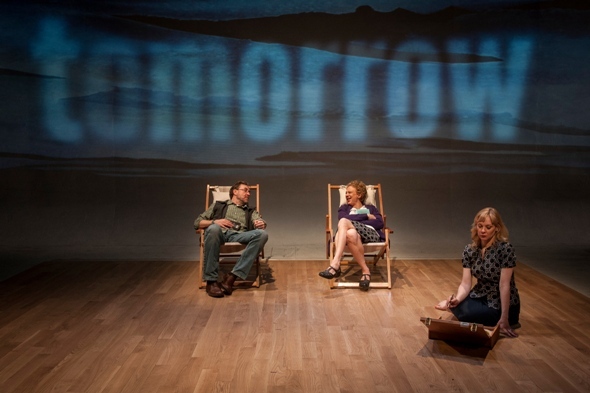 What playwright-director Dunford brings to the stage is an arresting story of familial love, and its resistance to the closing grip of despair. As foil to the vanishing kitchen things, Dunford has invented an alter-ego for Alice, literally a second character (the clear-sighted, no-nonsense Mariann Mayberry) who represents the woman’s sounder self: her interlocutor when she’s talking to herself, her vocal respondent – heard only by the audience — whenever she reacts in silence to the comments or actions of people around her. Herself, as Dunford calls this true Alice, hangs in there against Alzheimer’s rising tide. Yet as Alice’s mental competence declines, so does the vigor of Herself. It is a device of potent directness, touching in its very precision. When Alice first notices her forgetfulness, she does what any person with an analytical bent might do: She goes in for some tests. She wants to know what’s going on, and she accepts the truth of the results. So, if a bit more reluctantly, does her husband. His professorial distractions – and anxiety about the security of his own livelihood – initially lead him to assure Alice, the kids and himself that she’s fine, and that she will be fine. 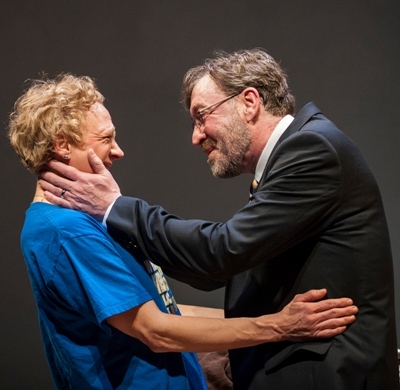 Christopher Donahue’s nuanced performance as the husband captures both the man in his habitual academic mode and the distressed guardian of his wife’s well-being. Ultimately, Dunford’s play hangs on the credibility of Alice’s struggle. Not just her decline, but her battle with this thing she can plainly see taking away her connectivity to the outside world, her sense of continuity, her very life as she knows it. Eva Barr’s portrait of a woman on the verge of cognitive disappearance is a theatrical tour de force. Even as she’s failing, Alice has stretches of such lucidity that she can address a conference on what it’s like to live with dementia. Other times, she gets lost in her own house, and the panic is horrible. Like a composer conducting her own music, Dunford shapes this production with the creator’s clarity, fluency and certitude. 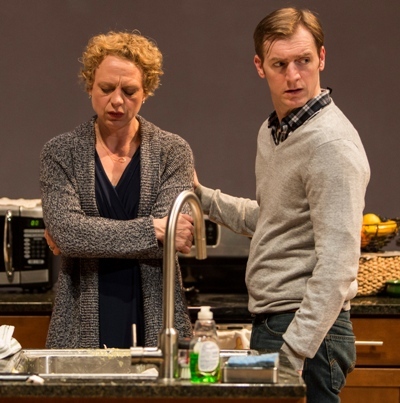 “Still Alice” indeed gives the impression of chamber opera, its music written into the words. It is immediate, concise and penetrating, a lyric tragedy touched with the sweetness of family.